The Ethnography exhibition is laid out in a representative approach depicting aspects of indigenous Zambian lifestyles in the country side, the people's material culture and intangible heritage as practiced in the past and has continued in the present time. The concept brings out societal dynamism with a division which is primarily based on themes and sub-themes. The village model depicts aspects of day-to-day activities commonly found in any village set up in Zambia. 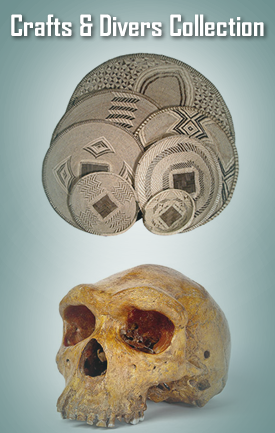 In striving to present a representative model, members of the public are able to identify themselves with the artifacts commonly found in their ethnic regions respectively. The guiding principle is the focus on salient features typical to the identified regions. Among the themes on display are hunting and gathering, agriculture, fishing, weaving, rite of passage, belief systems, body adornment, bark and leather cloth processing and leisure and recreation respectively. The exhibition has brought out a clear distinction of gender roles in society and as such the depiction gives a synopsis of Zambian heritage.